We always give parents a heads up on what to expect if they want to try for shots with sibling and newborn together. These shots can be a bit challenging, especially for siblings under the age of three years old. You never know what to expect, or what they will be game for during the newborn photography session. Sometimes we can get a sibling that is a total ham. However, usually during our Los Angeles newborn photography sessions, siblings are apprehensive about the whole process and not sure what to think about getting their picture taken. We always go at their pace and see what we can capture. We move on if any pose or set up is proving to be potentially unsafe for newborn. Newborn safety is always our top priority. This was such a wonderful Los Angeles newborn portrait session! I loved how all the set ups came out. We used a lot of neutral, soft shades of cream, white and peach that went so well with her skin tone and features. Further, some of the favorite images from her newborn photo shoot below are a few awake shots! Although we always strive for sleeping, peaceful new baby pictures, if baby arrives awake we just go with it and shoot! Parents usually think these are the cutest shots of the portrait session! Newborns will usually not look straight into the camera, but their expressions are often super cute. Sweet yawns, curious stares, and even sticking their tongue out to the camera! As long as baby is happy and calm, we love capturing these shots too. Baby E arrived wide awake for her Los Angeles newborn photography session! We started with an all cream look, using one of our favorite headbands from Goodnight Moon Props. Those newborn expressions are the cutest! She finally fell asleep and we had fun capturing her in sweet sleeping newborn poses. This set from Freebird Prop Shoppe is so pretty! The texture photographs beautifully. Sleeping baby courtesy of the Baby Shusher. LOL! One of our favorite angles during our Los Angeles Newborn Photography sessions is this top down aerial shot. The texture in the fabric and this sweet headband from Edna Magdalene is too cute. 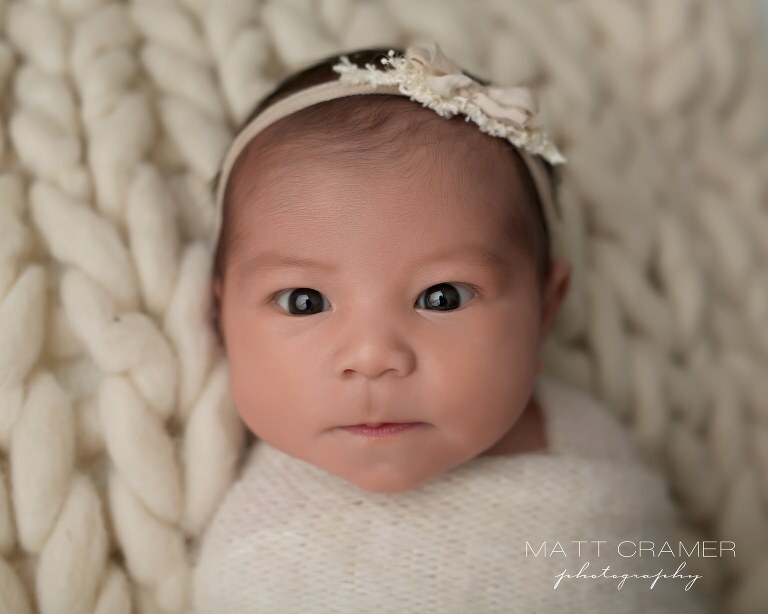 Matt Cramer Photography is a husband and wife professional photography team located in Los Angeles, specializing in newborn and baby photography. Our tiny clients come to our home studio for their sessions from all over the Southern California area including: Los Angeles, Studio City, Burbank, Glendale, Sherman Oaks, Pasadena, San Marino, West Hollywood, Beverly Hills, Malibu, Altadena, Covina, Santa Monica, Santa Clarita, San Gabriel, Porter Ranch, La Canada, Manhattan Beach, Hermosa Beach, Redondo Beach and more. 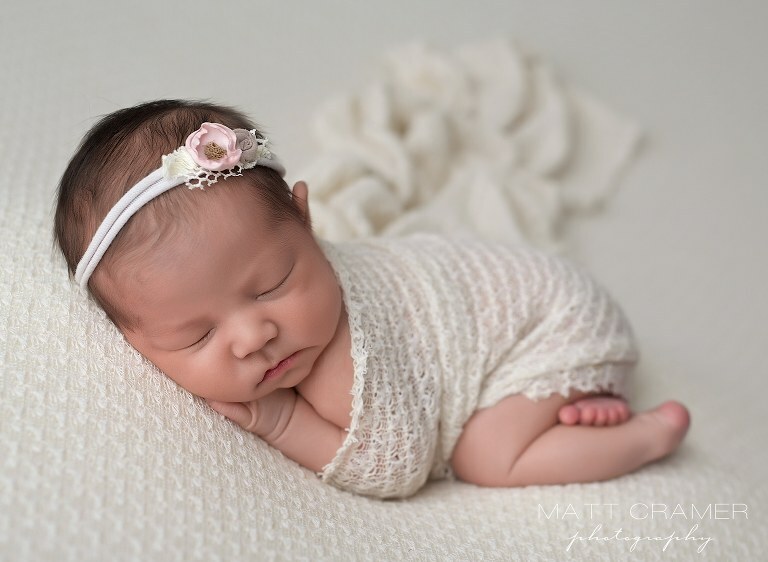 Matt Cramer and his wife Jessica specialize in Los Angeles newborn and baby portraits. For more information on our newborn sessions you can check out our Burbank Newborn Photography Session FAQ’s. Recent sessions are on ourLos Angeles newborn photo blog. More information on our newborn sessions can be found on our Newborn Portraits Los Angeles info page. Did you know we are the #1 ranked Best Newborn Photographer in Los Angeles, CA on Yelp? See our Los Angeles client’s Testimonials page. Recent newborn blog sessions in Los Angeles, and after newborn sessions we offer Baby Milestone Photo sessions in Los Angeles. You can find us on: G+, FB, IG, Pinterest, YouTube, Weheartit, LinkedIn.